a separate path for bikers and skaters alongside that for walkers, plus frequent placement of benches for relaxation. There were also reasonably many nearby opportunities for taking refreshment. To see such thoughtful and innovative use of human intelligence for public pleasure rather than advanced weaponry or media campaigns delighted me. The varied and intriguing views along the harbor and seawall walkway lured me into exercising my walking and biking muscles more than I had planned. While recovering from my exertions, I read books about Vancouver. One book, titled Obasan, gave me pause. I discovered that a park on the very same street as my hotel had served as the confinement camp for Japanese-Canadian residents of Vancouver during World War II. Canadian authorities deprived these Canadian citizens of their homes and possessions, and eventually forced them to live in eastern Canada or relocate to Japan, despite their having lived all of their lives in Canada . The book’s inclusion of the perspective of a child allowed the reader to experience the original unquestioning self-identification as Canadian followed by the increasing fear resulting from steadily rising and manipulated prejudice against Canadians of Japanese heritage. 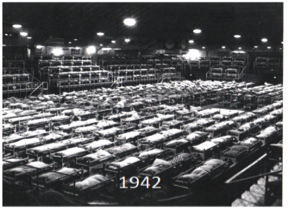 The United States had also interred citizens and legal residents of Japanese ancestry living on its west coast after Pearl Harbor. Contemplation of both histories was an uncomfortable reminder of the brazen use of racism in the current US Presidential election and triggered a twinge of fear that matters at home could deteriorate further. However, Vancouver’s more recent history provided a dose of encouragement about the process of human affairs. 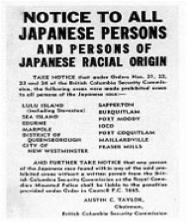 Canada had acknowledged the illegality of what it had done to the Japanese, albeit imperfectly Also, after years of discrimination against the Japanese and Chinese Canadians, Vancouver now touted the advantages of having the most Asian population (42%) of any city in in North American(42 %) and celebrated its Chinese and Japanese heritage. Native Americans are referred to as First Nations in Vancouver. The first design of the Museum of Vancouver had ignored the First Nations, despite the City sitting on what had been their territory. However, he Museum now, in response to First Nations protest, includes a section which tells the Vancouver story from their perspective. These and other gains by the Japanese and Chinese-Canadians and the First Nations people did not come easily; they required years of struggle. One of the most iconic of these victories has to be the return of the land on which the golf course of the University of British Columbia sits to the First Nation Musqueam peoples. The formerly errant Museum of Vancouver provided yet another message about the importance of struggle. Vancouver, the founding home of Green Peace, aims to become the greenest city in the world and has an ambitious Green Plan. It was not always that way. 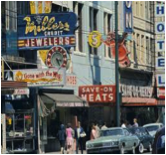 The Museum’s exhibition hall “ugly Vancouver” is bright with neon signs and photos of the cluttered commercialized cityscape of the 1950‘s. 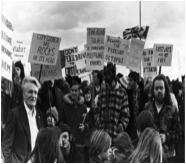 The rejection of that vision and roots of gradual shift to sustainable Vancouver lie in the hippie and other protest movements of the 60’s and 70’s. An exhibition space for this era documents the anti-authoritarian stance of the young people and provides records of both their celebration and vilification. 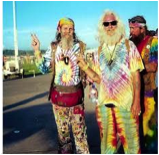 A videotape of the mayor of that time describes the hippies as a threat to Vancouver, Canada and, indeed, the world. However, the willingness of the youth to protest the norms of society was soon followed by neighborhood protests against City planner visions for eviscerating their communities to build a highway encircling the city and cutting the public off from the magnificent waterfront. The protestors prevailed. The green beauty and diversity for which Vancouver is famous today is testimonial to the importance of the existence and persistence of struggle against unreasoning authority. By the time I had exited its doors, this small museum had heartened me. Vancouver meets the diversity goals of sustainability in large and small ways such as: clean streets, recycling bins in hotel rooms, an airport showcasing stunning First Nation art, growing reliance on renewable energy, efforts to address their severe affordable housing problems and increasing use of sustainable mass transit. However, knowing that the expense of mass transit can be especially burdensome for the poor, I investigated and was pleased to discover that the Province of British Columbia provides an annual transit pass costing only $50 to those with very low incomes. . (This compares with a minimum annual cost of $1100 for Vancouver adults.) 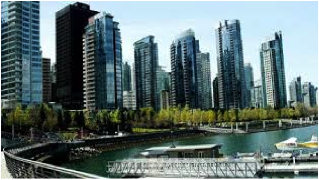 A particularly pleasing aspect of green Vancouver is the sight of tree tops, bushes and other plantings peeking out from low and high levels of the harbor’s high-rises. Happily, the plantings and gardens that characterize Vancouver provide not only beauty but also oxygen and storage of carbon and rainwater during storms. The high rises along the harbor gleam with jewel-like tones of green blue, gold and pink in the sunlight. When I viewed this collection from a distance, it brought to mind a gathering of the First Nation totem pole birds , which often sit atop the totem poles on display in so many places in Vancouver. Imposing and huddled into themselves, those totem pole birds usually had, it seemed to me, rather fierce and disapproving expressions. I found myself wondering what concerns the very tall glass “birds” lining the harbor would have. I first thought of the rising oceans lapping at Vancouver’s shores. Then the word earthquake occurred to me. Upon inquiry I discovered that Vancouver sits near three fault lines with an earthquake predicted to occur in the next 150-200 years. According to a visiting Japanese firefighter with earthquake experience, unlike Japan’s skyscrapers, these predominantly glass edifices lack sway resiliency. The damage from shattering glass could be horrific. Rebuilding these crystalline towers would, at first, likely be considered financially unfeasible. But perhaps the frowning glass and wooden totem birds of Vancouver will, over the next century, gradually influence this sustainability-minded city to invest in restructuring this vulnerable infrastructure before the inevitable quakes occur. Vancouver is a true lesson in the variability of human affairs. Its beauty did not come easily, and there are currently protests against the green plans of the mayor including complaints about bike lanes and energy taxes. As in my New York City home, conflicts accompany the rewards of diversity. Frictions exist among the varied and residentially segregated cultural groups. 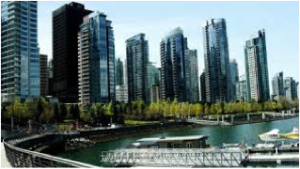 There is resentment about foreign ownership of empty apartments along the water front, while working Vancouverians struggle to find affordable housing in this extremely expensive City. 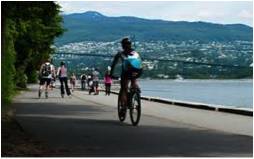 However, the breathtaking beauty of Vancouver, its accessibility, its ongoing efforts to face and solve current problems such as housing costs and the differences of diversity, and the past struggles that got the City where it is, combine to instruct us to dream a more sustainable future and to be prepared to fight for it.